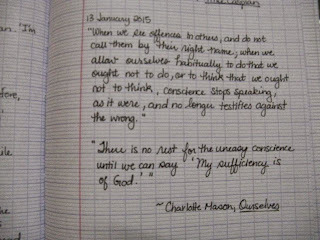 In my 2014 reading round-up post, I mentioned that last year I started keeping a Commonplace Book. Today, I thought I'd give you a little glimpse of it. "The Commonplace collects student-selected passages but from any and all reading on any and all subjects. Mason also refers to it as a Reading Diary. Though a Commonplace may contain student writing in the form of the odd character sketch or plot summary, it generally consists of other people's writing. 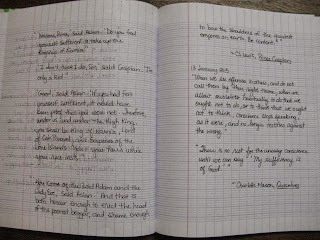 Like a graduated form of the copybook, it is begun in earnest by the student at middle or high school age when his learning is becoming more and more under his own direction and, ideally, used throughout life….the syllabus instructs Form IV [high school aged students] to 'keep a Commonplace Book for passages that strike you particularly.' 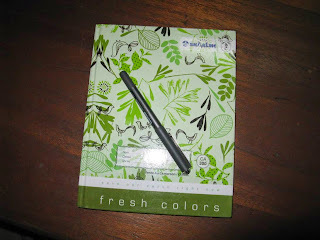 And likely students would have known exactly what was meant: a personalized notebook that crossed subjects and was meant to go with them everywhere as a dear companion and a record of their reading/learning." So really, it's just a book in which to jot down interesting quotes from your reading. 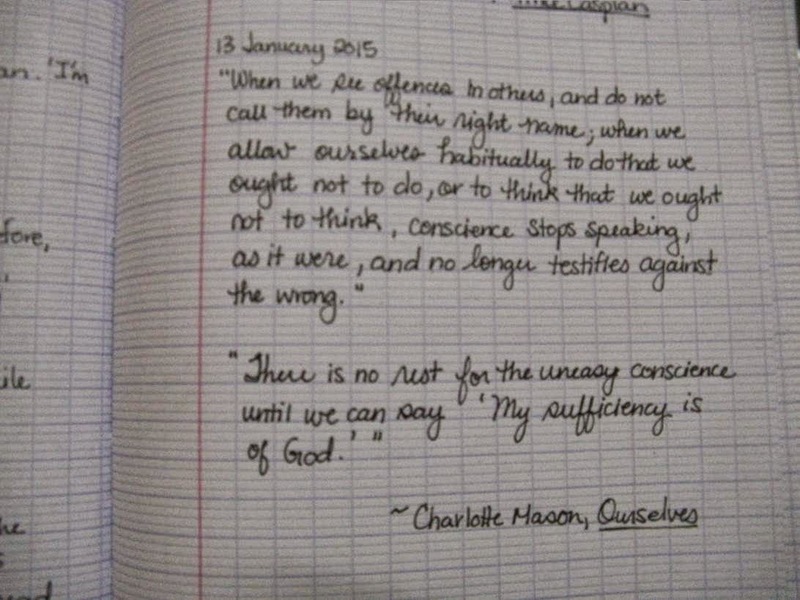 Charlotte Mason encouraged her older students to develop the habit during their school days with a goal of continuing as a lifelong practice. I started mine last year in part because I hated to mark up my lovely, old, rare (expensive!) copy of Essex Cholmondely's The Story of Charlotte Mason, and in part because I do much of my reading on the Kindle. While I do use the 'marks' feature frequently to highlight passages as I read, it doesn't have the same impact as highlighting and scribbling marginal notes in a real book. 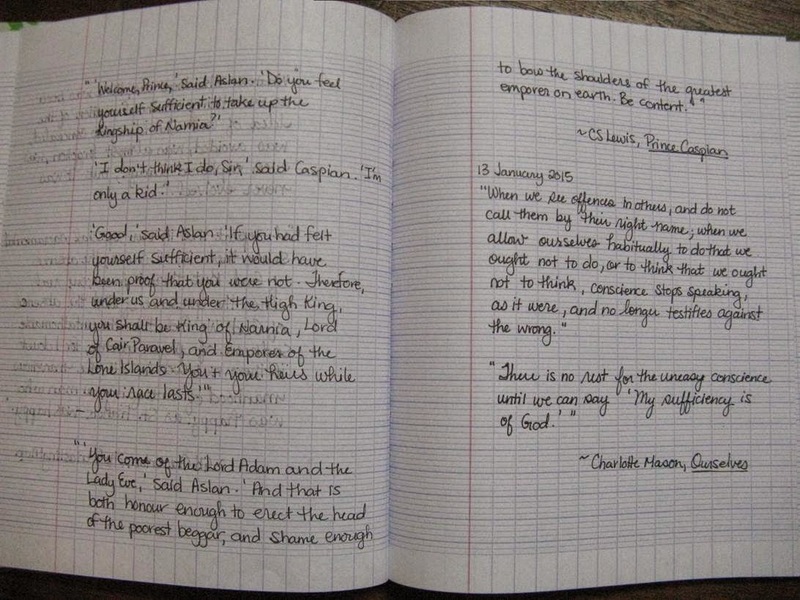 Jotting those quotes and notes down in a separate notebook seemed a good solution to that little issue. And that's it. It's pretty simple. I don't tend to put much other than direct quotes, other than occasionally a sentence or two to explain the context if that seems necessary. I've found this to be a wonderfully helpful practice. Taking the time to stop and write out by hand the interesting or beautiful or thought-provoking passage from a book has caused me to reflect and retain more than just reading and marking in the book. Looking back over previous entries jogs those memories too. It also forces me to slow down and read more carefully rather than just rush right through, something that is right in line with my reading goals for this coming year. 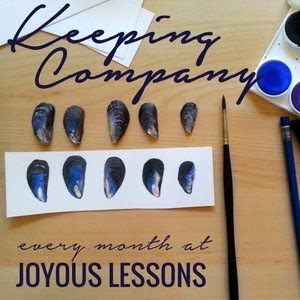 I'm sharing this post over at Celeste's new Keeping Company link-up at Joyous Lessons. Click on over and check it out for more 'Keeping' inspiration! Nice, Jen. I've never seen a book with lines like that. I'm curious about the rationale and how one follows which lines? Lovely! I'm the opposite I guess... 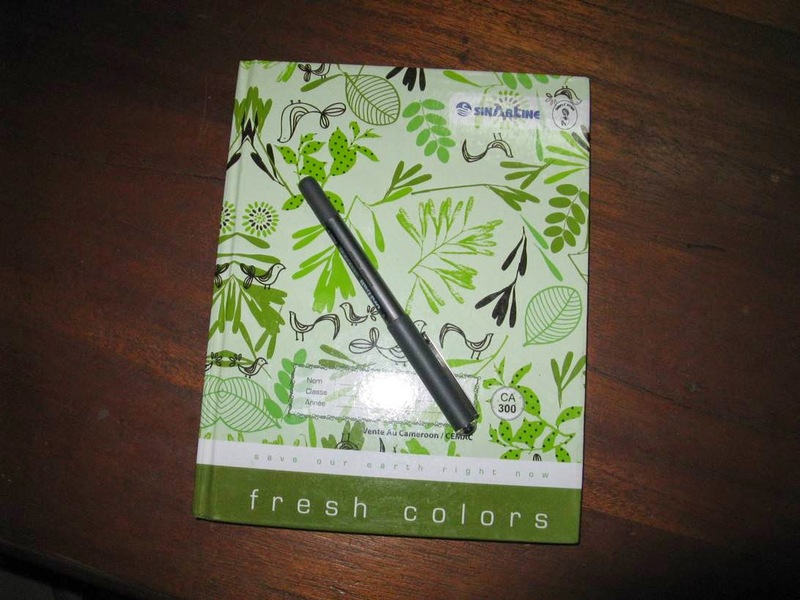 I have a very nice notebook but I use whatever junky pen is around. :P It will usually have my bank's name on it. And it is so fun to reread those quotes I've written, I'm finding mine is truly becoming a reading companion. I think all those lines would distract me too but having a decent pen is my biggest help. I always write more neatly if my pen writes smoothly.